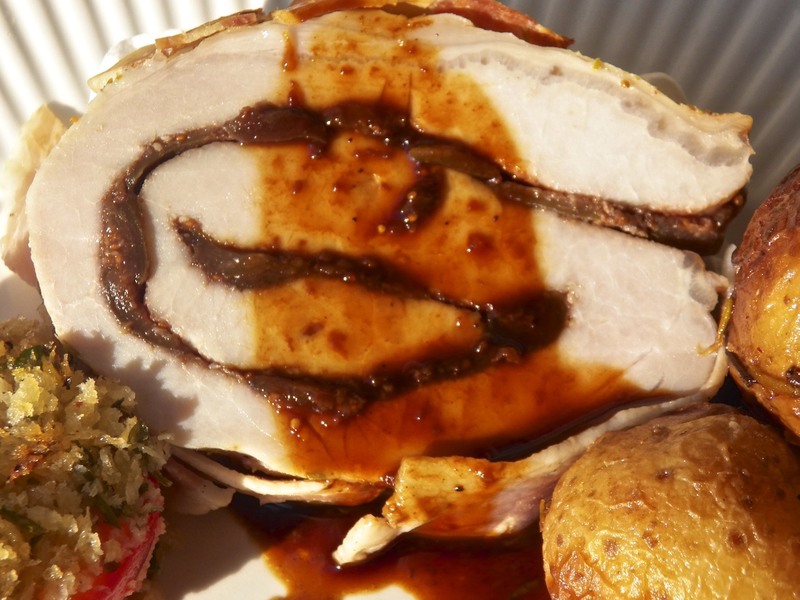 ‘Roast loin of pork’ sounds so boring and you bring it to life! Living alonesome at the moment I may not consider the piece, BUT . . .the fig preserves undoubtedly make the recipe An interesting food challenge 🙂 !! I hope your son enjoys this roast as much as I do. With all that flavour in the sauce and the pancetta I wonder why brining is necessary. I’ve never done it but have heard good things. Does the pork shrink as much as the “plumped” pork you get from the less expensive grocers? I had some fig preserves in the fridge before the blackout, sadly I think it may be toast since we haven’t had power for more than 24 hours. Ugh, all that wasted food. I’ll be cleaning out the freezer tonight! Such a shame, Eva! Even if you cook up a storm during the next day, you still cannot store it anywhere. I know. I once went without power for a week. I hope you get your power back before the day is out. When I brine a turkey, I use far more spices than I did here for this pork roast. You’re right. The preparation here is flavorful enough for the roast. Brining, also, helps keep the roast moist and that’s primarily why I did it here. Of course, there’s no need to do it and, if you don’t, the prep time – and mess — is reduced considerably –something I think about frequently when I’m trying to find room in my refrigerator for the roast & brine. Another great post. I learn something new from you every week. Thank you, Francine. That’s very kind of you to say. I would love nothing better than being a guest at your home with a main dish like this! Elegant, delicious, I am very fond of pork made this way. A little labor intensive, but not that bad, right? And you’d be more than welcome, Sally! This is a little labor intensive but you can speed things up a bit by skipping the brining. I like to brine my pork and poultry because it makes them so much more moist but it’s not necessary. Seasoning, wrapping the roast in plastic, and letting it sit for a couple hours does plenty to insure a flavorful piece of meat. Of course, the pancetta doesn’t hurt either. You are a jelly roll, roast genius! Oh my gosh, this looks extraordinary! The color of the jam baked into the pork is exquisite. I am salivating and it’s only 8:30a.m!!! I’ve never brined meat, but with the holidays right around the corner, I think I’m going to have to give this a try! I need to find a butcher friend too! Thank you, Tanya. This is a very simple brine because I didn’t want to interfere with the preserves’ flavoring. When I brine a turkey, I use star anise, bay leaves, a couple cinnamon sticks, peppercorns, and whatever else strikes my fancy, as well as the salt, sugar, and apple cider. The result is a very flavorful, moist bird — and a hassle trying to store it overnight the day before Thanksgiving. Very nicely done, John. I can just imagine all of those wonderful flavors. Sweet yet savory and accompanied with the roasted potatoes. My mouth is watering. Thank you, Richard. This does make a great, company worthy dinner. That does look delicious. But, being a singleton, it’s too much for little ole svelte me…HA! But still, it looks great! Looks yummy. 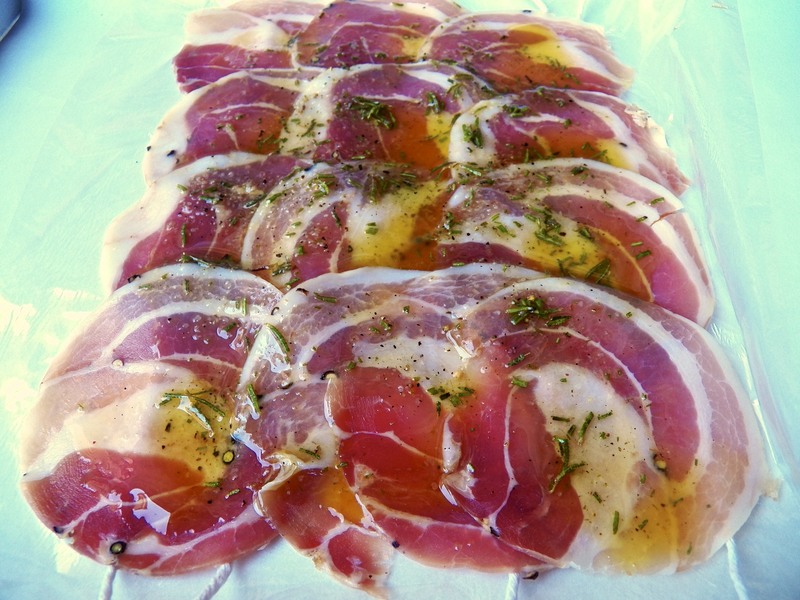 I absolutely love pancetta with roasted pork or chicken. It is so much better than American or English bacon. Also, the cider vinegar in the brine is an unusual twist. I’ll give that a try…. Thank you for commenting. 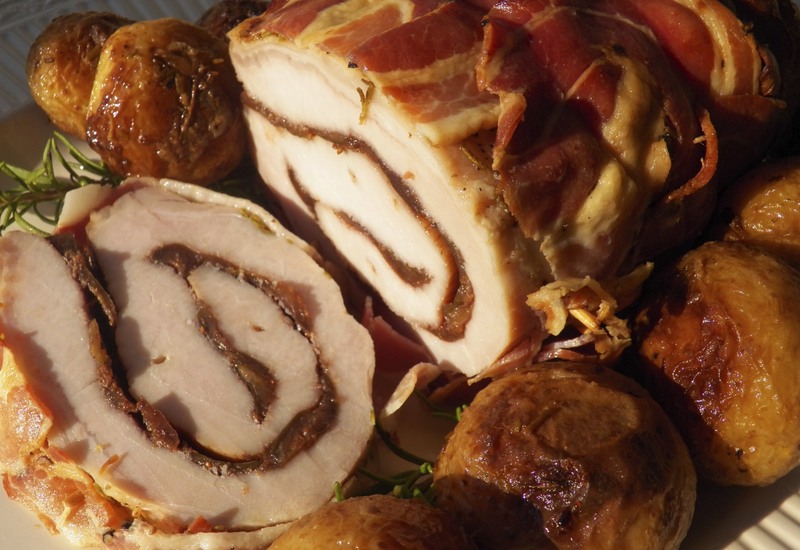 I agree and really enjoy the flavor that pancetta brings to a dish, especially roasts. Oops. Reading too quickly again. I like the idea of apple cider much better than cider vinegar — or perhaps just a bit of cider vinegar mixed in. Otherwise, you might end up with pork ceviche 🙂 But it would be fun to experiment. This looks yummy…too bad I probably can’t smell its deliciousness well yet 😦 And looking forward to the salmon recipe. Still under the weather, Teri? It cannot be much longer before you’re back at 100%. In fact, you’re overdue! Afraid so 😦 But there is light at the end of the tunnel..there better be!!! I’ve never tried to brine anything before, so I sure appreciate this tutorial. I really love this kind of cooking too, it’s so relaxing and comforting to me. I’d love to just stop the whole photography thing and do this kind of cooking every day. My challenge for this dish will be, not just to achieve the proper brine (not to over brine), but to make mine look as beautiful as yours. John, your food is gorgeous! I know this will be delicious. Added to the list! And again, Hubby thanks you. Me too! Brining is easy, Sarah, and this one is very simple. I get much more creative with the brine used for my Thanksgiving turkey. And remember, you don’t have to brine this roast. With the preserves, marinade, and pancetta, there’s plenty of flavor in this roast. I brine mine not so much for the enhanced flavor but to make the roast more moist. The choice is yours. I hear ya! Pork wrapped in pork. If I could have figured out a way to include bacon, I would have! It looks delicious! I have plenty of fig jam, so I think I’ll just add pepper and balsamic vinegar and try this with it. This is all your fault! 🙂 It was your post about making fig jam that inspired me to try my hand at making fig jam. So, thank you for this roast! I couldn’t have done it without you! confessions of a pescatarian: I won’t be clipping this recipe, but honestly John this is one of the most beautifully prepared roasts I’ve ever seen. The care you took with it, the brining, the pancetta wrap, your incredible figgy preserves and the herbs and spices you chose, just really Beautifully (impressively) done! Ya buddy…I’m pretty sure that you made this just for me. And if you didn’t this will be one of the dishes we feast on when Liz and I get back to Chicago. Man oh man!! ….though is that a Green Bay Packers “G” that I see in the opening image? Shame on you Mr. Bear. Is that what you see? I go through the trouble of monogramming a roast in your honor — or how do you spell “G”lutton? — and you insult me with a Pack reference. My heart is hurt, Jed. NYC has changed you. My family is sometimes a challenge when it comes to special meals. About half of us aren’t too big on meat, and the other half just can’t get enough. The big meat eaters sometimes get short shrift, as the vegetarian-types are the cooks! I frequently try to do something special for my son and son-in-law, in particular. This would be such a perfect holiday gift of a meal for them. And I think some of the lesser meat eating crowd would be tempted, too! There are at least six guys who might send you a holiday thank you card! 🙂 I don’t think I’m “in” for the snails, though. Salmon is great! My family often served a pork roast, porchetta, on the holidays. Of course, there was also a platter of ravioli to go with it. Not eat meat? I think my parents would have wondered where they went wrong. My brother liked his beef cooked well-done. My Dad never did approve. 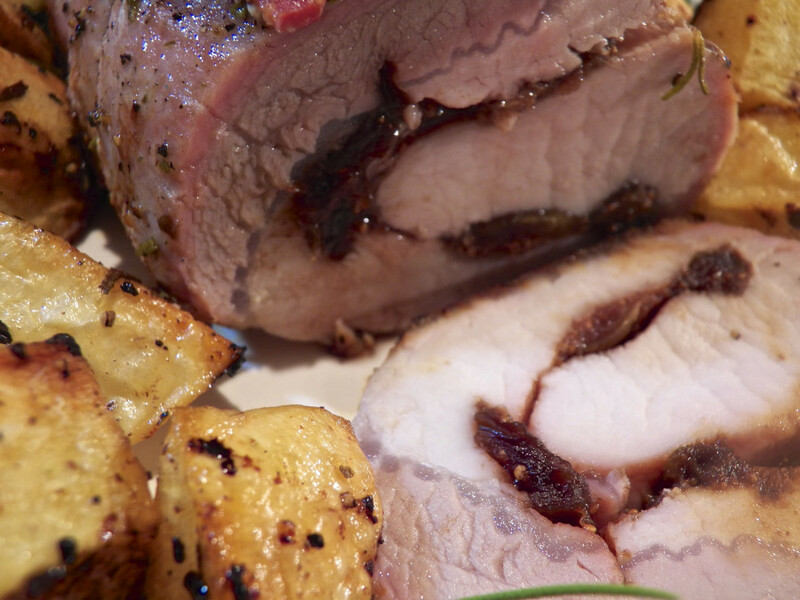 I love figs with pork…using you fig preserves with the balsamic and pepper must have really made the roast special. Thank you, Karen. It was a great dish and the sauce, sweetened by the figs, was a very good accompaniment. I highly recommend it. What a delicious and lovely combination. If I going to go through all that trouble with brining, I would most likely double the recipe and cook for the freezer. Trying to figure out how many meal-size portions i would get. Thanks, Norma, and that’s a great idea. I love a good sandwich, so, what I didn’t serve sliced with my meal, I used in my lunch sandwiches. Either way, you cannot go wrong. Still, the next time I make a roast, I think I’ll do as you suggest and freeze half. I’ll get at least one meal out of the frozen half and a few sandwiches, too. Thanks for the idea. This is truly a thing of beauty – and roasted potatoes too! Oh my and ditto ditto everyone else’s comments…this looks and sounds heavenly…the only thing is, I have no fig preserves…can you send us some? 🙂 can one buy fig preserves or could you suggest a preserve that would be similar and easier to find?? 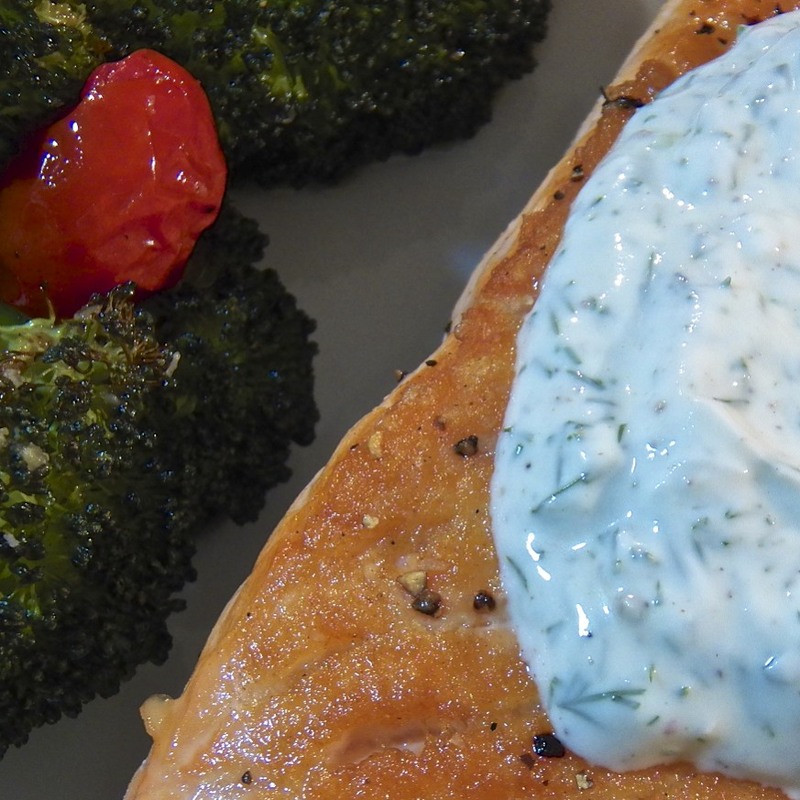 We live in the Northwest and catch our own salmon, so am looking forward to your recipe for salmon with dill! Yum!! Thank you but I’m afraid you’re just outside of our delivery zone. It ends at the Montana border. Wouldn’t ya know it! You may be able to find fig preserves at a high-end grocery or maybe even Whole Foods, though I’ve never looked for them there. Early this Summer, I made some strawberry preserves with balsamic and black pepper. I’m thinking of using them in a pork roast. You could use store-bought preserves as-is or maybe spice them up a bit with some balsamic and black pepper, to taste. A previous commenter has fig jam and she’s going to “doctor it up” before using it to stuff a roast. What do you think? I envy your fresh salmon. Back in the ’80s, my family moved to an area on Lake Huron where Coho salmon were stocked, their fry dumped in a creek that bordered the back of their property. When the Coho came back to spawn, it was just incredible! The program was halted due to budgetary concerns and I’ve never seen anything like it since — and do I ever miss those fish! I love fig and I bet it is so amazing with pork! What a beautiful recipe! Thank you so much! If you like figs, then this is the recipe for you! You’ll love it! I bet my boyfriend would too! It’s new to me (like many of the other commenters) to roast brined pork, but I may just give it a go as pork is one of our favourites regardless of season – cold roast pork with salads in summer is worth a warm kitchen:) I love and will also take on your suggestion of replacing the pan water with wine & stock in the later stages of roasting. Thanks, EllaDee. I find that brining a roast — poultry or pork — results in a more flavorful and moist roast. I did it here just for the moisture; the roast has plenty of flavor with the herb marinade and pancetta. You could skio it here and not really notice. I would definitely advise brining chicken and turkey. I add more spices to the brine and the effect is wonderful. I like that it looks so good and beautiful at the same time! I’m really, really dying to make this! 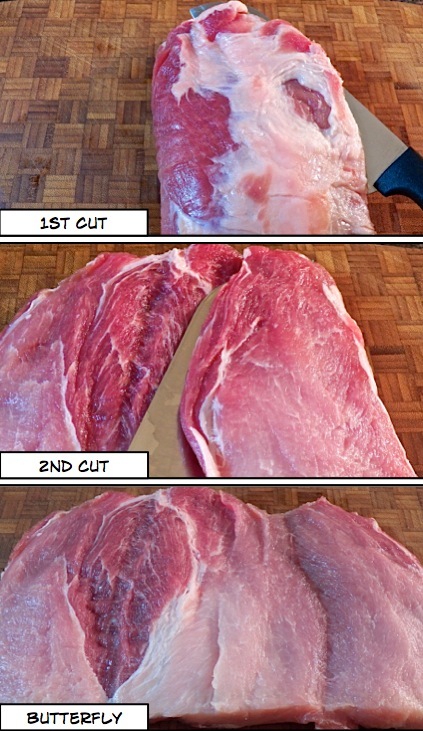 I’ve been wanting to stuff a pork loin forever and this looks like the perfect recipe! Wish I could find one of those sales and butcher! Butchers aren’t very common in these parts. Love it! Thanks, MJ!, I’ve made it a point to get to know my butchers and the people behind the meat counter at my grocer’s. Both will butterfly a roast for me, special order a specific roast or meat, and let me know of upcoming specials. They really have been helpful. Buona sera, BAM! This roast was on my mind as I was making my fig preserves. It didn’t disappoint. And the sauce, flavored by the fig drippings, worked out well, too. As I’ve mentioned, I’m thinking of trying it again with some strawberry preserves that I also made with balsamic and pepper. I bet it will be every it as good as this roast was. What a beautiful roast John. The step by step is perfect and I like the idea of sandwiches the next day(s). I love this time of year when we can heat up the Kitchen without being uncomfortable. Thanks, Dave. Yeah, I love having a roast or some braise in the oven this time of year. Sure, it will get old by the time February rolls around but, for now, this is great! And yes, this roast makes one great sandwich! Super recipe! The fig preserves really sound excellent with the pork, and they’re so pretty nestled in the folds of the pork loin. Nice photos! I used to brine pork (and chicken) a lot, but have gotten out of the habit. Silly, because it does add quite a bit of flavor. This recipe has enough flavor that the pork wouldn’t demand a brine, although that would definitely enhance the pork’s flavor. And I’ll bet the sauce you make with the pan drippings must be wonderful! Good tips and a good post – thanks so much. Thanks, John, for leaving such a nice compliment. I agree that this roast certainly doesn’t need to be brined; it has plenty of flavor from the marinade and pancetta. I brined the pork because it makes for a more moist roast. It, also, afforded me the opportunity to explain the brining process. Judging by the comments, many haven’t brined anything before. That’s so true about switching th eoven on John!! It’s cottage pie tonight – warming and comforting, but I’d happily sit myself down to your meal. How clever to use Fig jam, a favourite of mine! I’m wondering whether quince jam would work too? Thanks, Claire. Got any pie left over? It sounds so good for a chilly evening like we’re having. 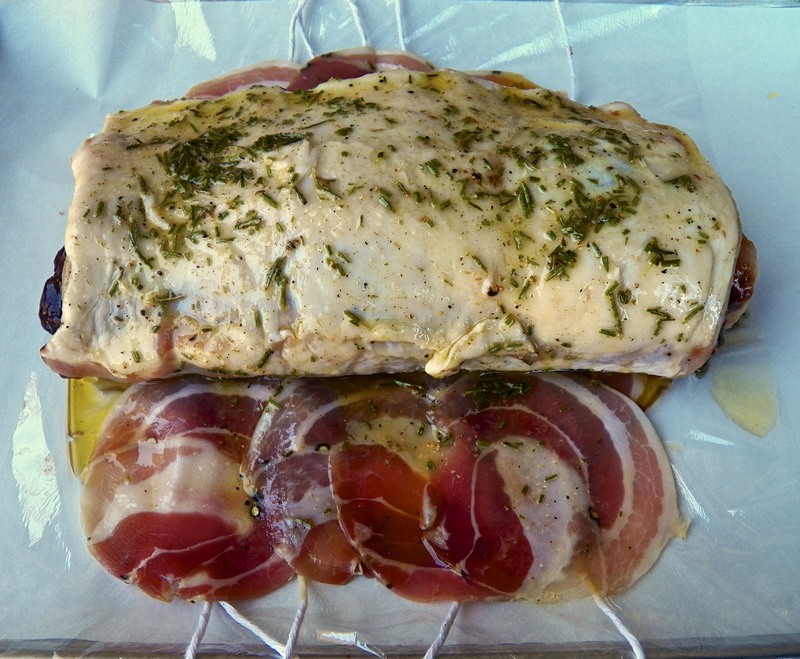 What a beautiful pork loin roast and gorgeous pancetta! Pork roast and fig jam is one of my most favorite combos in the world…they just sing together. I love your preparation because it gets a good jam to pork ratio going on, plus some gravy/sauce. 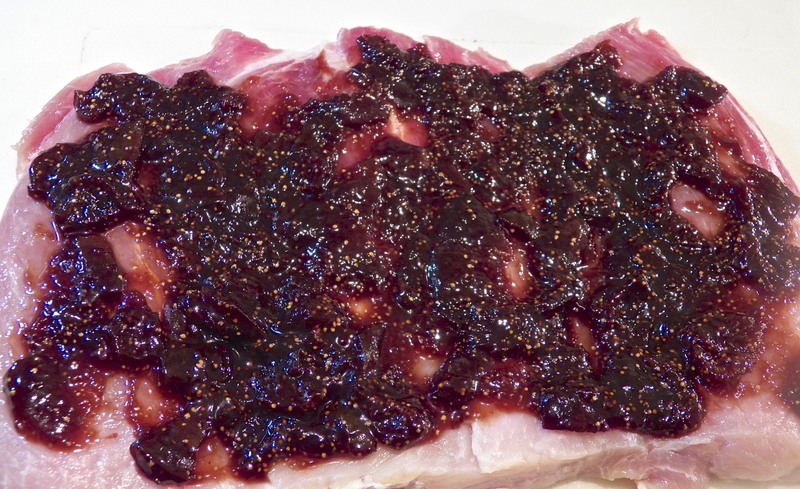 My current fave has been an herbed pork loin topped with pancetta and served with a port wine and fig jam alongside…but I want to try your version now! Thank you, Betsy. I’ve seen some recipes where the pork is stuffed with bread and jam but I’m not such a fan of those. For me, a simple stuffing works best. I look forward to seeing the recipe and am glad you can use dried figs. I’m running low on my preserves. Next year I’ll make a double batch! I must admit, Barb, to being shocked when you wrote of your area’s snowfall. Your Summer was so short and Autumn more so. Chicago was on the far outside reach of the storm. We had winds sweeping down Lake Michigan, causing 25 foot waves but, unless you lived right on The Lake, there were few problems. I had expected some power outages due to falling tree limbs but that didn’t happen. I’m so glad, too. With so little to do here, our repair people can go East and lend a hand. Like many, I’m in a state of disbelief over the extent of the damage. Parts of the coast will never be the same. So sad. Oh wow John that looks and sounds amazing, and by the look of the number of comments you have here, everyone agrees! Love the idea of brining it, and it looks so special. Definitely one I´ll be making when I get back to the Land of Pork! Glad to hear that you are safe and sound…how awful the storm was for so many people. Thank you so much, Tanya. I’m really do enjoy this roast and will be making it again soon. Next year I’m making twice as much figs preserves! We were on the far outer limits of the storm’s reach and had little effects other than some strong winds. Parts of the East Coast, on the other hand, will never be the same. We’re all very thankful the loss of life wasn’t greater. Thank heavens people heeded the warnings and evacuated. Wow, this is such a treat. I have pancetta, but am out of figs. Your timing is funny though, I just made a stuffed loin and I was thinking of fig preserves yesterday with something different. I must have known I needed to come here. Seriously, this is fantastic. Thanks, Greg. I’d no idea these fig preserves would be so good and “useful.” Next year I’m making twice as much. I hope you plan on posting the recipes for both the stuffed loin and the other dish you were contemplating. Now that I’ve (finally) mastered butterflying, I’m a stuffing fool! Gee, thanks, Celi, but I seriously doubt I could ever write something that could distract you from your writing. That’ just impossible. It’s not just bacon, Celi, it’s damn good bacon! Hey, Christina! You’re right about the figs. They do add a lot to the roast and are well worth the extra effort. I never heard of brining before, John. The fig preserve would no doubt be a perfect accompaniment for the port, your number 2 roast looks wonderful! I learned to brine about 10 years ago using a turkey. Since, I’ve expanded it to pork and other chicken. The meat is more moist and flavorful. You should try it sometime. I’m here to answer any questions you may have. Holy cow this looks amazing! The flavours at the end must be to die for. Thank you. Yes, the flavors of this roast did come together well. If you try it, be sure to make the sauce. It really does compliment the roast. That’s good to know. I’ll check, as well, the next time I get there. Thanks. Nice presentation John and I love the idea of combining figs and pork. It’s so nice when dialogue results in new recipe ideas, isn’t it? I sometimes scour comments of my favorite recipes on Epicurious.com. It’s a gold mine! Hello, Michael, and thank you. And you’re so right. I’ve learned so much from our fellow bloggers and I always look through all of the comments before trying a recipe from an unknown site. I’ve gotten some pretty good tips from them. Reading your posts John is like watching a master chef at work. And the result looks absolutely deliciius. John, this roast looks amazing. I literally caught my breath when I saw the first photo. I will definitely be trying this (albeit with a purchased fig jam), and your clear instructions will help me every step of the way. And, by the way, I highly approve of adding the riesling to the pan juices for a flavourful sauce. I find the addition of wine makes all the difference! I’m hosting an Italian themed dinner party this Saturday, and it’s a toss-up between this roast and my tried and true Spezzatino di Maiale. If I go with the stew that will only be because I can make it ahead and heat up just before the party! Thank you very much, Mar, for such a nice compliment. This is a very tasty roast, one that I’ll be sure to make again and again. Next year I’m making more jam, too. It takes courage to try a new recipe when guests are seated at your table. I’m not so sure I would do it. I learned the hard way. Oh yes, I’ll be sharing that recipe. I’ve been making it for over 10 years now, and I still remember the first time I had it. 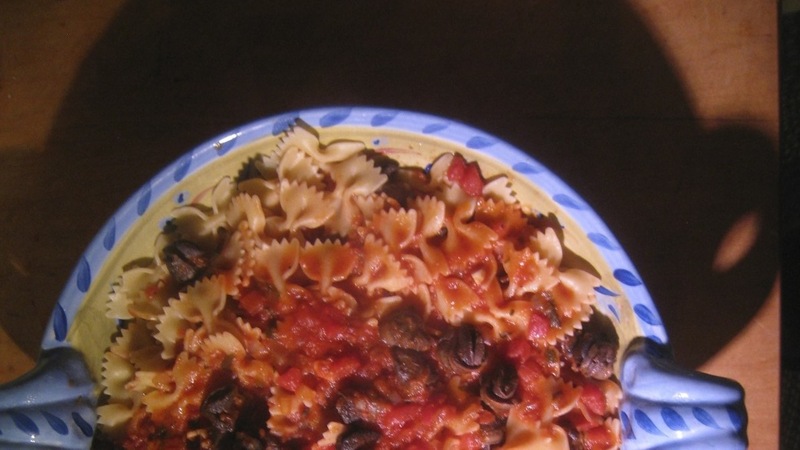 It was so much more flavourful and bright than the (non-Italian) beef stews I’d been used to. Certainly on my top-ten savoury dishes list! I love making pork roasts, but I find my challenge when we have company is getting everything to come together at the right time. Nothing worse than having to delay dinner in 15-minute increments while waiting for the roast to come to temperature. Or worse, having to hold it while waiting for side dishes to finish. Don’t get me wrong, I don’t mean to make myself sound like a total klutz in the kitchen, but the last minute timing issues can be stressful. I find a stew eliminates a lot of that! I can’t wait to see this recipe. A good pork stew is a wonderful thing! Oh I bet that was very tasty and tender!! 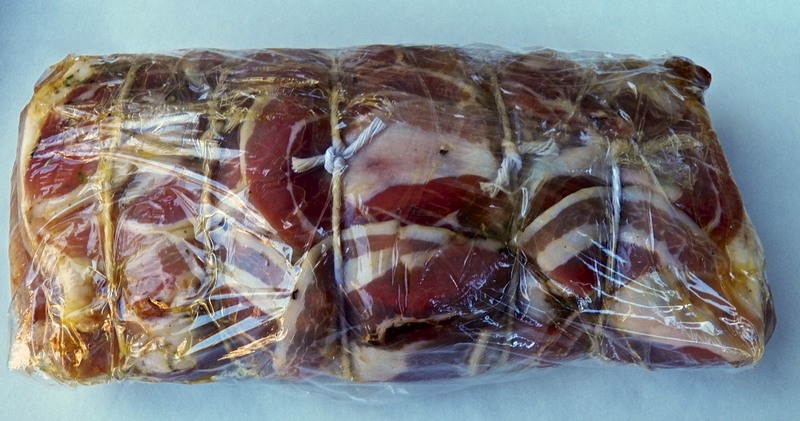 After the brining and wrapping in proscuitto, it just all sounds fabulous, the perfect fall dinner. Good idea to roast the potatoes separate! Hey, Linda! This is my new favorite way of preparing a pork roast. The fig preserves really do go well here. I only wish I’d made more preserves. Next year I will. And yes, since some of the fig preserves will “escape” from the rolled pork, roasting the potatoes in the same pan was a mistake. Never again! Wow, that pork looks really good! I didn’t think I’d be able to do something like this… but maybe I can. Good pics and instructions too! Sure you can! If butterflying the roast is a concern, your butcher (even the one working the counter at your grocery) will do it for you. There’s no need to brine it if you don’t want to. The rest is easy. Just go slow and you’ll be fine. And you’ll be amazed at the result! Yea! I always enjoy a good family recipe… I’ll keep that in mind. Figs, balsamic and rosemary – an inspired combination – oh, my. And the addition of flavor-filled proscuitto is so decadent! Of course, the potatoes look perfectly crisp. It’s time to break out the roasting pans, for sure. Your family and friends are very lucky! ! ! ! ! It looks incredibly flavorful and succulent! I think that the plum and cardamom jam would be lovely in this dish. You could even try a bit of lemon thyme… it would go nicely with your delicious jam.